My date has one blue eye, doesn’t chew, smacks his lips and is selfish when it comes to food. So, why even bring him to Log Haven? The better question: Will there be a second date? I live with Ranger, and he’s a dog. So, he’s forgiven—plus, this good-lookin’ fella is a great hiker. To treat ourselves after a jaunt up Burch Hollow Trail—also in Millcreek Canyon—with Bodhi (my roommates’ other dog) and my human friend, Katy, we went to Log Haven’s Dog Days of Summer (daily, 5:30-7 p.m., through Oct. 15), where four-leggers can join their owners on the pristine hillside amphitheater lawn. Upon arrival, the smell of lilacs, the waterfall vista and the vivid greenery caught my attention, but the unromantic dogs went straight for the tableside dog bowls and biscuits. 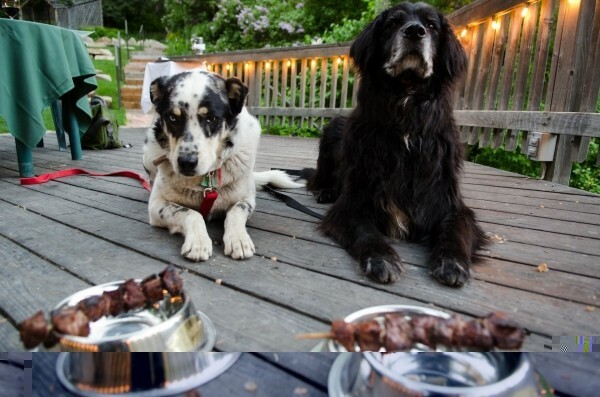 While some places tolerate pups, at Log Haven, they’re treated exceptionally well; ear scratches, biscuit refills and a main course—a kebab of grilled bison steak—are part of the five-paw treatment. I’ll confess, I actually tried a bite of the dogs’ bison (how could I not? ), and it was delicious. Ranger and Bodhi didn’t need a doggie bag. Katy and I didn’t need one, either. Chef Dave Jones’ dishes blend contemporary Americana with regional panache. Nothing’s over the top, yet every dish we ate was thoughtfully crafted, with delightful layers of flavor. We drooled, like the napping, post-bison dogs under us, over our entrees: crispy-skinned Utah steelhead trout with pan-fried noodles, spring vegetable salad, kimchi paste, miso butter and furikake; and the smoked duck and hand-cut serrano-chile pasta with poblanos, habanero cheddar, mango salsa and chipotle butter. It was a truly stunning culinary experience for all four of us. My other roommate, who’d stayed home, later said, “When we ate dinner, we wondered if the dogs ate better than us.” Yes, they did.